We still don't know how much the Nissan Leaf electric car is going to cost, but apparently it will be comparable to that of a gasoline-powered car of the same size, which means something along the lines of $15,000 to $25,000 or so. Together with this I just remembered an article here from CTV last month, detailing a plan from the government there to offer rebates between $4,000 and $10,000 for consumers that buy electric cars after July 2010, which is when the Leaf will be available. The government there and Toronto in particular is also planning to provide public charging facilities, which is a nice bit of infrastructure for those owning the vehicles, effectively doubling the range if you plan to be in the city for a few hours before you leave again (or within an hour if you use the quick charger). The other advantage to be given (a green licence plates that allows drives to use carpool lanes even when there is only one driver) is a good one and reminiscent of something that has long been used in Japan, where extra small cars are given the best parking spots, parking spots that are painted so that regular-sized cars don't fit. Insurance is also cheaper. 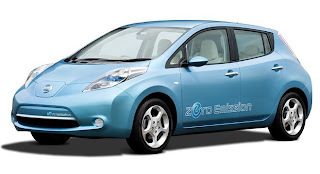 Their plan is to have every 1 in 20 cars on the road electric by 2020, but with a car like the Leaf it will probably be even cheaper to buy an electric car outright, which will be a huge advantage.